I dunno what this guy was thinking when he decided to send this to AI, ‘cause it doesn’t really fit into the area of music that is generally covered therein. Whatever, while I can’t say I am all that familiar with the whole Tigerbeat 6/Cex/Blechdom from Blectom electronic scene, this CD is a pretty good approximation of what I think those groups sound like based on the descriptions that I have read - cheap sounding keyboards with cheesy drum programs, toy instruments, all topped off with a heavy gross-out lyrical focus in amongst some cultural satire/mockery. It gets noisy at times, which was fine, but the beatbox stuff rapidly wore out it’s welcome. I managed to make it through this a couple of times, but that’s only because I had to review it. Your mileage may vary, but this is just not my bag at all. For more information you can visit the <18to49> web site at: http://www.angelfire.com/nj3/18to49. 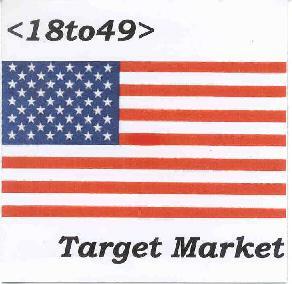 Target Market is available for $10 at http://www.cdbaby.com/18to49.